This post is part of Jewels of Elul, which celebrates the Jewish tradition to dedicate the 29 days of the month of Elul to growth and discovery in preparation for the coming high holy days. This year the program is benefiting Beit T'shuvah, a residential addiction treatment center in Los Angeles. You can subscribe on Jewels of Elul to receive inspirational reflections from public figures each day of the month. You don’t have to be on the blog tour to write a blog post on “The Art of Beginning... Again”. We invite everyone to post this month (August 11th - September 8th) with Jewels of Elul to grow and learn. 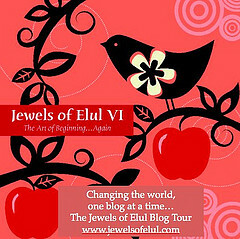 We hope you’ll share the program now with your friends and followers to spread the word about Jewels of Elul. If you’d like to, you can also folllow Jewels on Twitter or join the Facebook group. Deuteronomy 20:5 Then the officials shall address the troops, as follows: "Is there anyone who has built a new house but has not dedicated it? Let him go back to his home, lest he die in battle and another dedicate it. 6 Is there anyone who has planted a vineyard but has never harvested it? Let him go back to his home, lest he die in battle and another harvest it. ..."
This section is particularly appropriate for this time of year, she observed, because it's about our goal for Elul: finishing so that we're ready to begin. Yes, we have the freedom to start anything at any time–but can we truly renew, release bonds, until those loose threads are tied? Well, it would be lovely if life had the good graces to work according to the Jewish calendar, with resolution achieved like clockwork. But what if I can't make peace with those I've wronged by the end of Elul, or Yom Kippur, or even by Hoshana Rabbah, the day when those gates really, finally, close? Am I out of luck until next year? I don't know—but I don't think so. I love that in Judaism there's always another chance. Year after year we find new light in the darkness on Hanukkah, learn how to be free on Pesah, grow up as ethical beings on Shavuot; starting over doesn't happen just once, even though Elul gets all the press. Remembering that every day is an opportunity to reboot takes some of the pressure off for me at this time of year. But not all of it. I've been thinking about this a lot lately because Elul for me, this year, is mostly about my role in the process of someone else's re-beginning. As readers of this blog know (all 5 or 6 of you, thank you immensely), a few months ago, incredibly, after 11 years in the National Marrow Donor Program registry I matched with a stranger to be a bone marrow donor. It was scheduled for July, but she had a setback and it was postponed indefinitely. My speechless awe tumbled quickly into anger—how dare God have the chuztpah to offer hope, and then yank it away? In truth, I had no idea of the extent of her illness, or how much hope there ever really was. All I knew was that I might be cheated out of the gift of being able to help. And after grumbling for a few days, I realized I was more upset about losing my opportunity to do a cool, once-in-lifetime mitzvah than about the recipient's grave situation. I hated this encounter with my own selfishness and impatience, which I tried to explain as a reaction to God's random screwing around with the timetable. I felt completely powerless; it drove me crazy. This was Elul, the time to fix. I wanted to DO something. My Elul for the past 6 years had been about action—rehearse, sing, feel like a wrung-out sponge, and then like a new person. The Elul of waiting around was my old life, been there, done that years ago in Row Z of a moribund synagogue in Queens. But then I thought about the waiting of my recipient. How could she possibly bear it? Did she try to reimagine time, creating new holidays, new beginnings and endings, in place of the real ones she might never again experience? Unable to take action and grab onto life, to complete any task at all, was she able to glimpse the future through love, laughter, the light of the sun coming through the trees? I hope so, because this unknown woman (I named her Bracha—all I know about her is that she needs blessings, and everyone deserves the dignity of a name), this Bracha, by the simple fact of her existence and surprise of our connection, has taught me not to stress out over Elul. My beginning for this year happened in March, when I first learned I was a match. Maybe something was resolved in order to create that beginning, or not. It doesn't matter; what counts is that it changed me. I started exercising, to make sure I was in good shape for the donation. I plunged back into the world of dating after a long hiatus; I figured those odds must be better than the ones I just beat of matching to a stranger. Bracha reminded me that life must be grabbed onto, over and over again, to renew even when messy, loose threads of unfinished business stand in the way. And life may end up fitting neatly into the calendar this year, after all. I recently learned that Bracha is now stable, and the donation has been rescheduled for the end of Sept. For the day of Hoshanna Rabbah, in fact—when the gates symbolically close, and we really, finally, do begin again. So much growth here...what an amazing and inspiring story. I will pray for you and "Bracha"...but want you to know, the fact that you are a match, that she is experiencing hope and you are feeling awe in the mystery of being a donor...well healing has already begun, is happening right in this moment. May this be a year of many renewals, over and over again...awakening each day with gratitude for the blessing of all that you are, do, give, receive. Gratitude for nishmat chayyim filling you and allowing you to be here.